Chaotic CAD is where everyone does what they darn well please. No one talks to each other. No one cares about developing Standards. In fact they may actually think that standards get in the way of productivity or creativity. 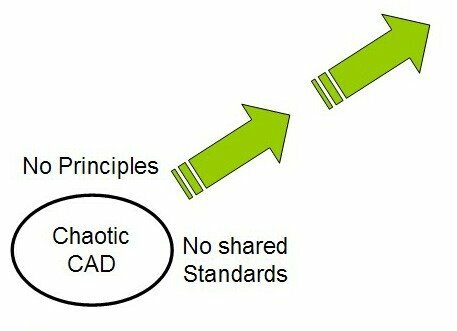 In Chaotic CAD everyone is left to make the best of each file or each project. Nothing is refined. Everything is done as if it were the first time. No lessons learned. No improvement by unification, either in process or practice. It may appear to be getting the job done because the files do get plotted correctly, but the heartache continues to the next project because nothing is put in place to develop best practices. Individual users may get better, but when they share files the chaos begins. In a shared environment the goal is to unify. The issue is not who is right and who is wrong. It may be that they are just doing it differently. But the difference can mean frustration, lost time and major headaches.